One Perfect Day is a well-equipped, charming villa. It has a five-star kitchen with tons of appliances, massive outdoor space, and equally tricked-out bedrooms. Each suite opens to the terrace or balcony and has a four-poster bed, so everyone can have their own private retreat. 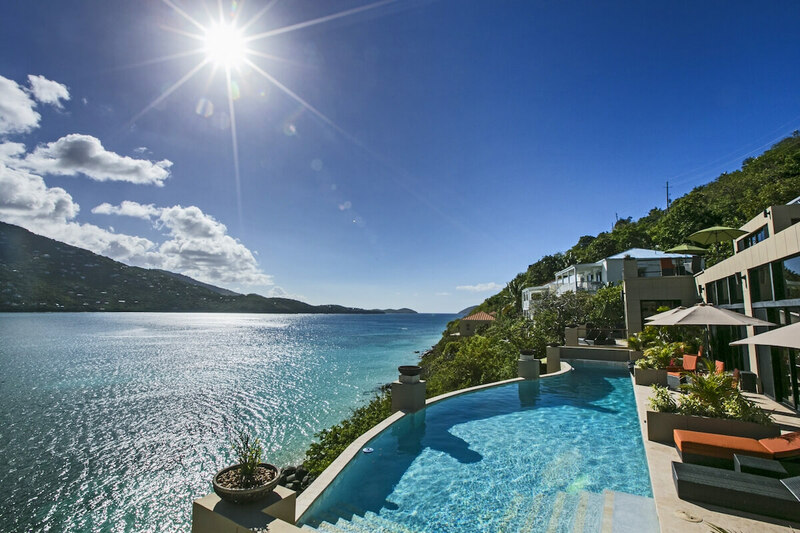 Luxurious villa steps from Magens Bay! One Perfect Day is a modern oceanfront home with lush, layered gardens and an open design. This fully air-conditioned villa is perched on a hill above the sea on the Peterborg Peninsula and enjoys ocean and beach views. A custom pool faces the sea and surrounding island. The stone terrace runs along the side of the pool and has loungers, umbrellas, and armchairs to relax in. A set of stairs leads down to the shallow, family-friendly beach. The wide, open coastline is perfect for long walks and morning runs. Stairs run all along the back of the villa and lead to the grilling area, meditation garden, and yoga pavilion. Guests can enjoy every meal outside thanks to the outdoor kitchen, which has a wet bar, bar top seating, a BBQ grill, a dining table, and a double sink. There’s also a hot tub under the palm trees and cushioned seating everywhere. Zen statues are placed strategically throughout the gardens to remind guests to relax and soak in the moment. The fully equipped fitness area has resistance machines, cardio equipment, free weights, and a wall of sliding glass doors. No matter how large the group, there’s plenty of space for everyone to relax outside at One Perfect Day. High ceilings and spacious floor plans mimic the extensive terraces outside. Travertine tile runs throughout and there are ocean views in almost every room. The game room has a billiards/ping pong table, a wine cooler, a Keurig, and lots of seating. There’s casual seating in the living room as well, so guests can watch movies on the flatscreen TV in comfort. The living room leads down to a sunken lounge that connects to the pool deck and faces the ocean view. In the gourmet kitchen, guests can use two stoves, two microwaves, oversized fridge and freezer, and stainless steel appliances to cook delicious snacks and feasts. The center island has a six-burner gas cooktop and bar seating for 4, and a wall of artwork separates the kitchen from more dining. Each of the nine bedrooms has seating, a desk, a four-poster bed, exterior access, and an ensuite bathroom. The Master Suite has a king bed with white mosquito netting, a sunken shower, and a soaking tub in the center of the bathroom. Downstairs, the king suite has a separate lounge area with couches, a flatscreen TV, and two sets of bunk beds. Every suite has either a king or queen bed, a mini-fridge, and a coffeemaker. There are two outdoor showers as well. One Perfect Day is near Magens Bay, which has a restaurant, bar, and gift shop. Guests can easily drive over to zip lining, snorkeling, and even Blackbeard’s Castle thanks to the island’s small size. Upon arrival guests will secure a rental car and drive to the villa using the directions provided by their villa specialist.